Blowout Sale! Save 53% on the Mirascreen K4 Wireless Screen Mirroring Adapter Wifi Display Dongle for Education&Business Support Miracast DLNA Airplay for iphone Android and Windows Black Color by Yehua at AABX. MPN: K4-B. Hurry! Limited time offer. Offer valid only while supplies last. How To Use 1.Connect HDMI Interface to TV/Projector HDMI Port.Connect USB Power Adapter Cable with Device and Power Adapter. Watching the TV Screen. 1.Connect HDMI Interface to TV/Projector HDMI Port.Connect USB Power Adapter Cable with Device and Power Adapter. Watching the TV Screen. 2.Check wifi signal(SSID and Password) of Device and connect. 3.Open the Mirroring Function in Your Phone(Different phones has different name for this function).Find Right Name In Your Setting and start Casting. 4.Please check your phone system first to make sure that support casting function. 5.Android Device and IOS device setup way is different. IOS device like iphone. Ipod, ipad iphoneX both support Airplay.Only need to open Airplay. Supports the streaming of movies, videos, audio, TV,files, PPT,and so on. Popular on School Teaching, Business Meeting, Home Theater, Game Playing.Provide you big screen experiences. 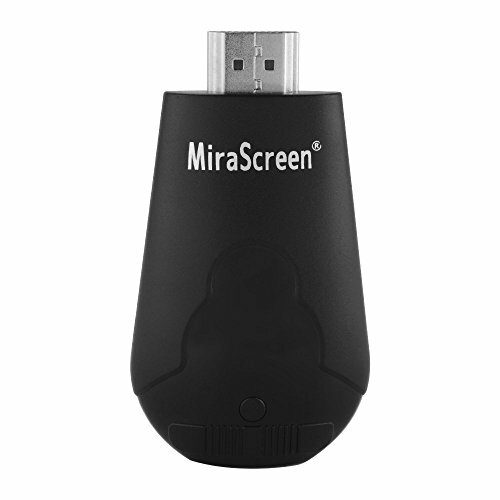 Mirascreen Wireless Display Receiver compatible with Miracast(Android Device),Airplay(IOS Device),DLNA(Windows).Casting Screen from your phone to Big Screen. 1080P High Resolution: 1080P HD High Definition for Mirroring Screen/Mirroring Casting.More Clear Than Other Device. High Speed 802.11ac WiFi 2.4G +External Antenna.Very Stable in Mirroring Screen and Casting Videos. Attention: 1. The dongle must be powered by power adapter(at least 5V/1A ). 2. Not Compatible with Netflix,HBO go, HULU and Honda motor. 3. Please check whether your Android smart device supports MiraCast(if not, it not works). 4. Please do check the Manual User or the description before connecting.